A roundup of 25 '80 PARTY FOOD IDEAs. Fun food ideas. 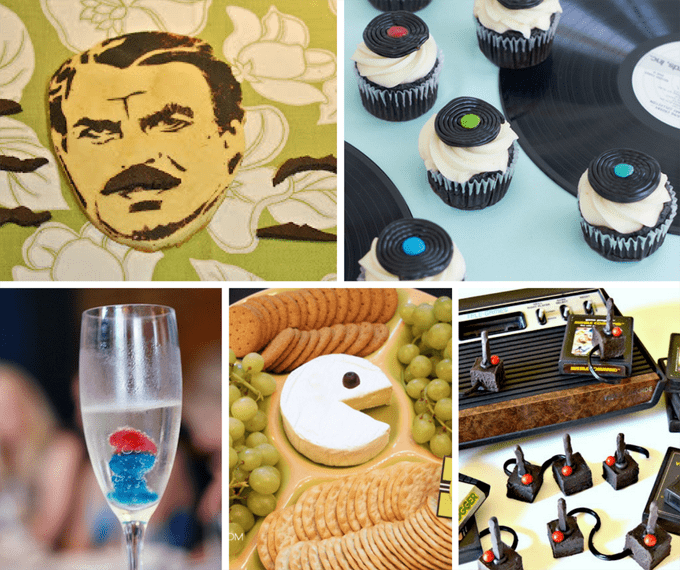 A roundup of 25 80s-themed party food ideas. Anyone else such a fan of the ’80s you’re hosting an ’80s party and need some ’80s party food ideas?? Oh the ’80s. I was born in ’72, graduated high school in ’90, so the ’80s are my prime years. And I’m proud of that. Despite the fact that the years between 8 and 18 we are the most self-conscious and awkward, why do we love the ’80s nostalgia? Maybe it’s the memory of youth when every possibility was ahead of me. So let’s list some ’80s memories. There are so many more. Leg warmers and wig wam socks and jelly bracelets and Forenza sweaters. Men at Work and REM and the Smiths and Tears for Fears. Breaking apart Rubik’s Cube in frustrations. Cabbage Patch Kids, Nerds and JellO pudding pops. Pac Man and Breakout. (Well, we didn’t have Atari, we had Intellivision, so for us it was Frogger and Pitfall.) Every line of The Breakfast Club committed to memory. My prom dress was strapless, taffeta and had a bubble skirt. Yeah, the ’80s were totally tubular. 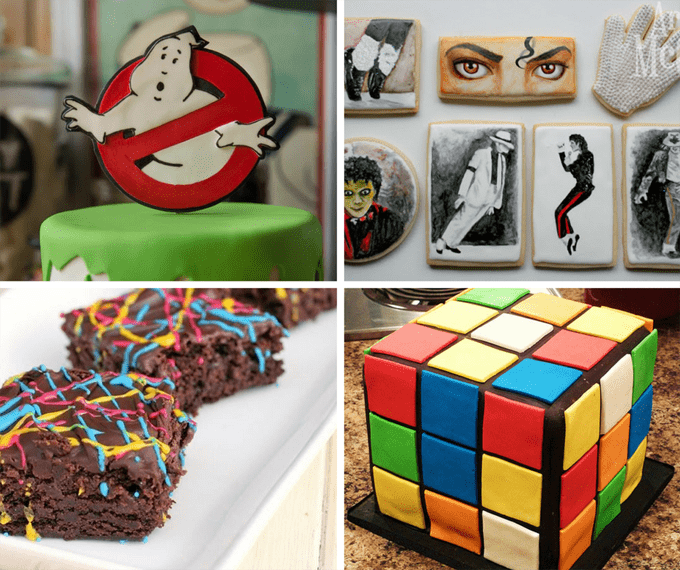 So if you have an ’80s party coming up (or if you’re just obsessed with the decade), here are 25 ’80s-themed food ideas to serve. 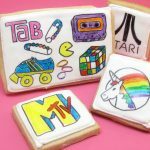 Make ’80s cookies at the decorated cookie. You’ll need to make Cabbage Patch Kid cupcakes, by SemiSweet Designs. And Golden Girls cookies. Oh heck yes. Make Fast Times at Ridgemont High cupcakes at Sugar Swings! Serve Some. 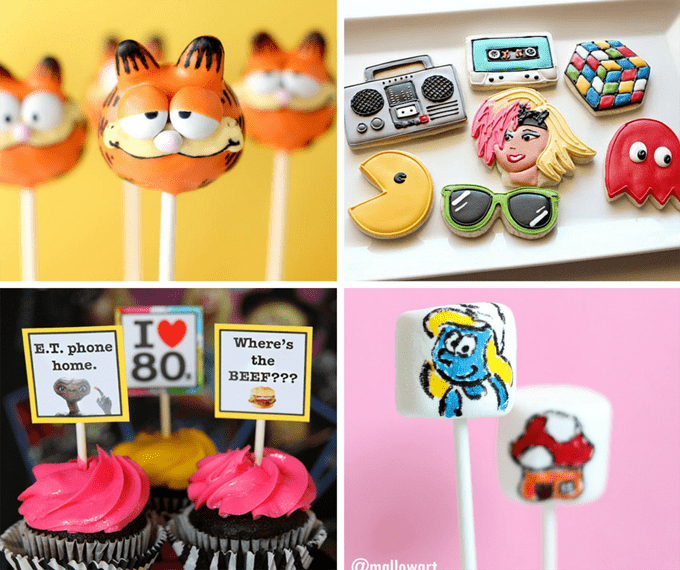 Make Garfield cake pops at bakerella. 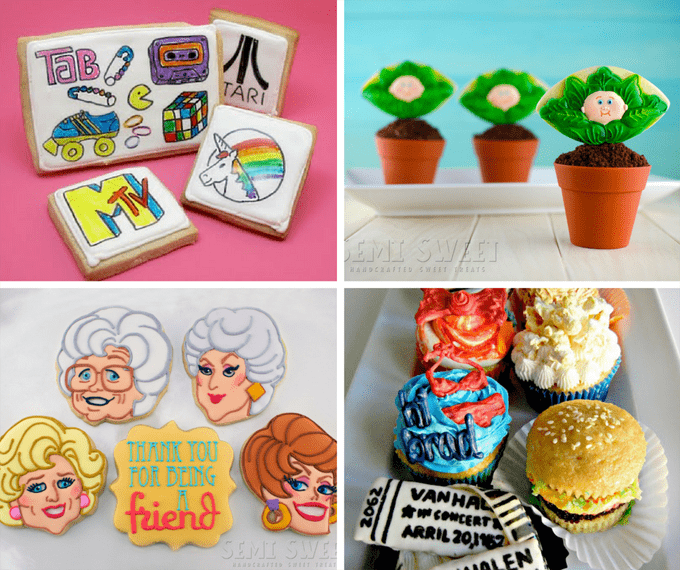 I adore these ’80s cookies by Sweet Sugarbelle. 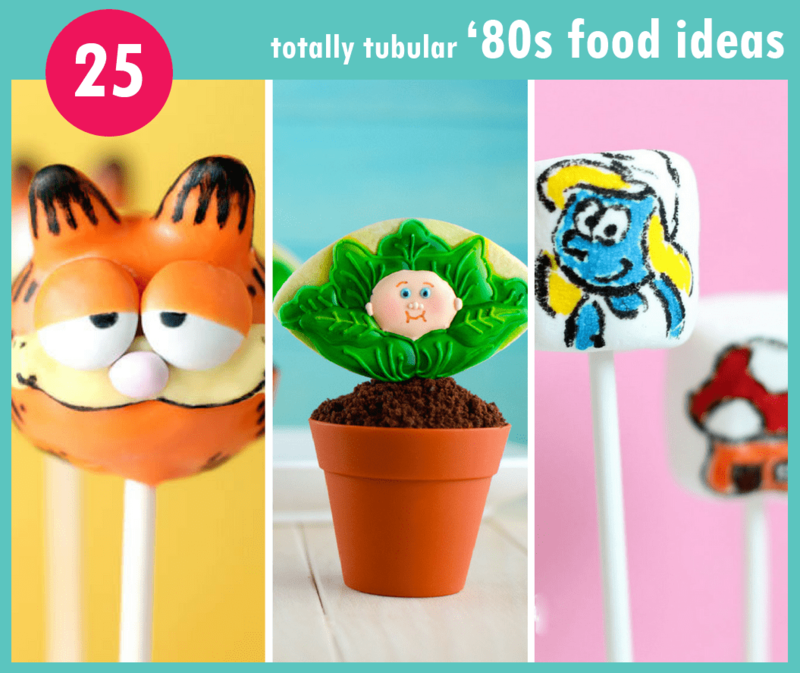 Make your own cupcake toppers at Living Locurto and have any ’80s image you like. 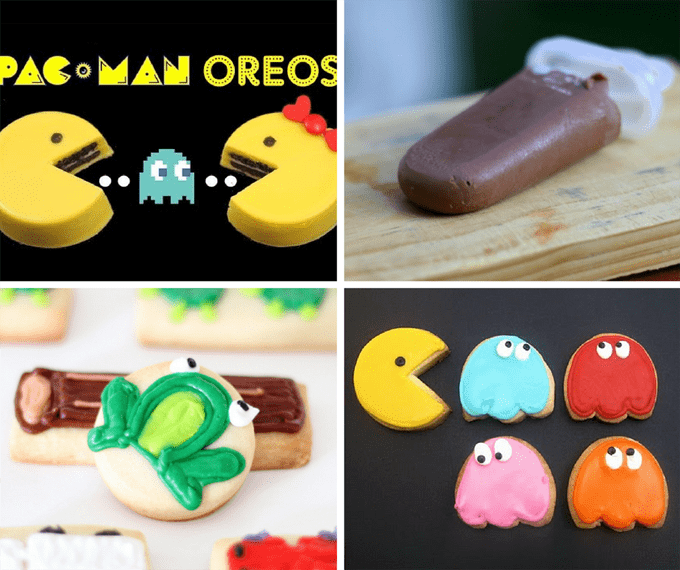 Make Pac-Man Oreos with My Cupcake Addiction. Make homemade Jello pudding pops at The Frugal Girl. Make Frogger cookies at the decorated cookie. Or make Pac Man cookies. I love this Ghostbusters cake at Kara’s Party Ideas, and all the Ghostbusters ideas. Check out Michael Jackson cookies at Arty McGoo. Make neon scribble brownies at Betty Crocker. Make a Rubik’s Cube cake at People. Or, make Rubik’s Cube brownies at Nerdy Nummies. Make Space Invaders chocolates at Wrapped up in Rainbows. Make a cassette tape cake at The Chic. 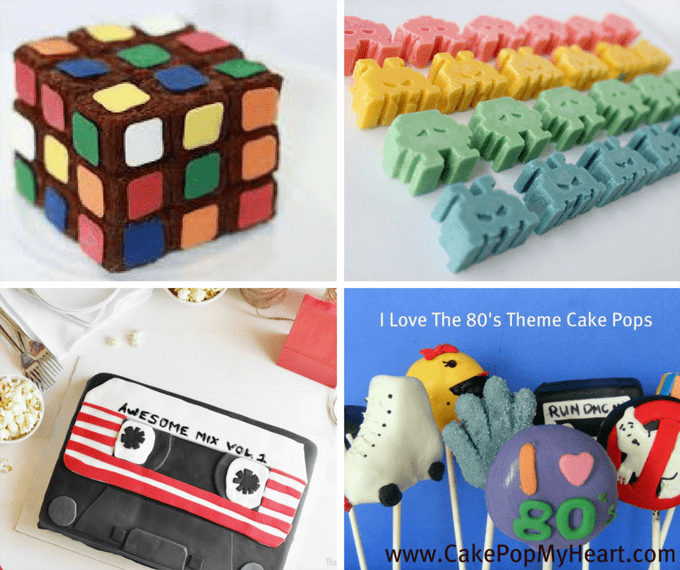 Check out these ’80s cake pops at Cake Pop My Heart. Make Magnum PI cookies at 37 Confections. Make record cupcakes at Studio DIY. Make your drinks Smurfy at Gordon White. Make a Pac Man cheese platter at Amy’s Party Ideas. 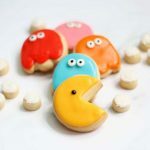 Make Atari joy stick fudge at Sugar Swings! Serve Some. I’m an 80’s baby. I love these ideas! Woohoo! Go ’80s babies!! Last generation to know what it was like before AND after internet.